Welcome to Jack's Tracks for Sunday, August 31, 2014! We say good-bye to the eighth month this year. Here's what Jack choose today. Remember, if you want a pawtograph photo of Jack, please email Producer Chris. Jack will pawprint it and mail it right away! Enjoy your super Southern California holiday weekend! Stay tuned for all the latest news, information, and great music on Rez Radio, 91.3 FM! Local San Diego County artists are highlighted in blue. Jack's Stick Chasin' Third Hour! Jack picked out a three hour show and compressed it to two hours! The annual Pala Tribe Pow-Wow is on Rez Radio until 6 p.m.
My dog Jack was out at the big music pile and found Poway's own "Saxsations"! He grabbed a couple of songs and insisted we open the big bark show and feature them every hour. 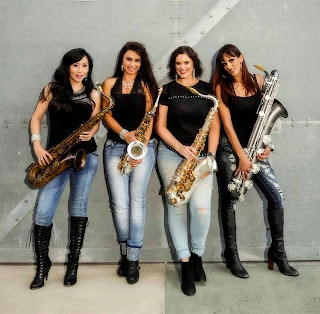 As the post on the Saxations website: eight legs and four horns. Hear them plus Candye Kane, Jimmie Lundsford, Cactus Honey, Missy Andersen, Eve Selis, Billy Watson, Nathan James, Mercedes Moore Band, and much much more! What a pawtograph picture of Jack? Please email me at ProducerChris@JacksTracksMusic.com. Jack will send one out. See you on the radio at 4 p.m., each Sunday on KOPA/Rez Radio at 91.3 FM, or streaming world-wide at IHeartRadio, Tune-in. Please look for "Rez Radio" or KOPA. Visit Joe Nelson's radio news page at sandiegoradio.org! Big Bone Chewin' New Music Hour! Welcome to Jack's Tracks Music for Sunday, August 10, 2014! Jack and I have been exploring and diggin' up some new music. We've been to Ohio, Niagara Falls, Pittsburgh, and a four mile stretch of West Virginia. On the Rez Radio today from 4 'til 7 p.m. New music, seasoned music -- and a couple of songs from Jack's Vault. 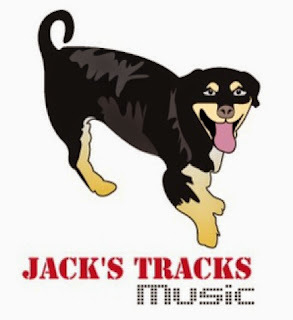 Thanks for stopping by Jack's Tracks Music!